Which are the best places to visit outside Barcelona on day tours? Barcelona has many world class sights and attractions near Barcelona. They can be easily be visited by public transport or on half-day or full day tours from Barcelona. On this page we tell you about the most popular day trips outside Barcelona. Scroll down for detailed information, photos and maps. The biggest attraction near Barcelona is the Montserrat mountain mountain. It is home to the Montserrat Abbey and shrine of the Montserrat Black Virgin "La Morenta". 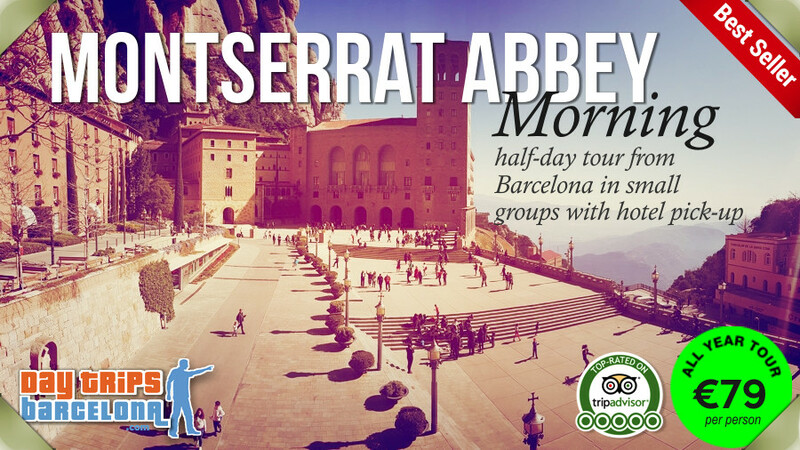 Montserrat welcomes around 2 million visitors a year and is the top attraction near Barcelona. Montserrat is about 1 hour by car or on a tour bus from Barcelona - it takes a little longer by train - maybe 1.5 to 2 hours. Scroll down the page for details. The city of Girona is the next most popular day tour from Barcelona. Visitors love Girona's medieval gothic center, Roman heritage, the medieval Jewish quarter and the filming locations from Game of Thrones series six. Also popular is the Dali Museum in Figueres which was created by the great artist himself. The stunning Costa Brava coastline is also a fantastic day out. The Costa Brava starts 1 hour north of Barcelona and continues all the way to France. The Costa Brava is a little more difficult to reach by train and bus, but it can be done. The main attraction of the Costa Brava are the villages, cliffs, beaches and coves along the coastline. If you have never seen snow or high mountains, then rent a car or book a day tour to the majestic Pyrenees mountains and the tiny micro-state of Andorra. Andorra is 3-4 hours by car but worth seeing. All this and more can be seen on half-day or full day tours from Barcelona. Most attractions outside Barcelona can easily be reached by the high-speed AVE train, by regular train, by regional bus. If you want to avoid the hassle of planning and want to cut down travel time, then many companies offers day tours from Barcelona and small group day tours from Barcelona. Montserrat mountain and Montserrat Abbey is a world class tourist attraction and an area of great natural beauty and spirituality very close to Barcelona. See the unique rock formations of Montserrat. Take mountain trains and enjoy beautiful views stretching to the Pyrenees mountains and the Mediterranean sea. Visit the Monserrat monastery and basilica which has a thousand years of history. Perfect for day tours and half-day tours. Montserrat monastery is also a key location in the bestselling author Dan Brown's new book 'Origin' published in October 2017. Girona - City of Sieges & Game of Thrones. Girona is a historic jewel just over an hour north of Barcelona full of legend and beautry. No wonder it was chosen as a location for popular TV show Games of Thrones series 6. Girona is famous for its colourful hanging houses over the River Onyar, for the well preserved medieval Jewish quarter and for the walled Old Quarter (Barri Vell) with its dramatic history dating back to Roman times. Visit the beautiful villages and beaches of the famous Costa Brava coastline of Catalunya that starts just 1 hour north of Barcelona. In the winter you can enjoy the stunning scenery and in the summer you enjoy a swim in the crystal clear waters of the Costa Brava beaches and coves. Andorra and the Pyrenees mountains. There is no direct train or air link to Andorra which is a tiny country nestled in the Pyrenees mountains bordered by Spain and France. You can take a bus from Barcelona to visit Andorra but it's not really practical for a 1 day tour. The best way to see Andorra in one day from Barcelona is to book a full day tour from Barcelona. There is an excellent tour called the Three countries tour. It starts in Spain, then visit France and Andorra and the beautiful Pyrenees mountains on a day tour from Barcelona to Andorra. Andorra is a small country entirely situated in the Pyrenees on the border between France and Spain. On a day road trip from Barcelona you will spend a unique and wonderful day crossing three country borders and mountain passes in one day while enjoying fantastic views, mountain roads and romanesque churches. Tarragona is a beautiful coastal city just 1 hour south of Barcelona by car or train. It is the capital of the Spanish province of the same name and the capital of the Catalan comarca Tarragonès. Tarragona was the most important Roman city and the Roman capital city of Spain. The Roman imperial city was called Tarraco (full name is Colonia Iulia Urbs Triumphalis Tarraco) There are many impressive roman ruins in Tarragona, including the Amphitheatre of Tarragona (pictured above), the Roman circus and the Roman aqueduct. The Roman ruins of Tarraco have been designated a UNESCO World Heritage Sites. Sitges is a village so it has a tiny historic center with a couple of local museums, a nice church and a lovely promenade for walks. There are small group tours to Sitges but mostly as a stop on the way back from a visit to either the wine areas of Catalonia or Montserrat mountains. Generally tourists visit Sitges in the summer. There are 3 Dalí musuems near Barcelona which is called the Dalí Triangle. All three Dalí musuems are in the Girona province of Catalonia, Spain. The most popular is the world famous Salvador Dalí Theatre-Museum which is also the biggest Dalí museum which is in his birth town of Figueres. Figueres is the capital of the county of Alt Empordà, in the province of Girona, Catalonia, Spain. This museum is best reached by train or by tour bus. Tip: The Dalí Theatre-Museum is very popular in the summer and they don't sell skip-the-line tickets, so the only way to skip lines is to book a tour in advance that includes fast access. The other smaller but equally fascinating Dalí musuems are the Dalí house-museum in Port Lligat, where Dalí and his wife Gala lived for most of their lives. Port Lligat or Portlligat is a coastal village in a small bay on Cap de Creus peninsula, on the Costa Brava of the Mediterranean Sea, in Cadaqués in the Alt Empordà country, in Girona province of Catalonia, Spain. The third and least known and least visited is the Gala Dalí house-museum in Pubol, where his wife, Gala Dalí resided alone for the last years of her life. Púbol is a village county of Baix Empordà, in the province of Girona, Catalonia, Spain. There are no Dalí museums in Barcelona. 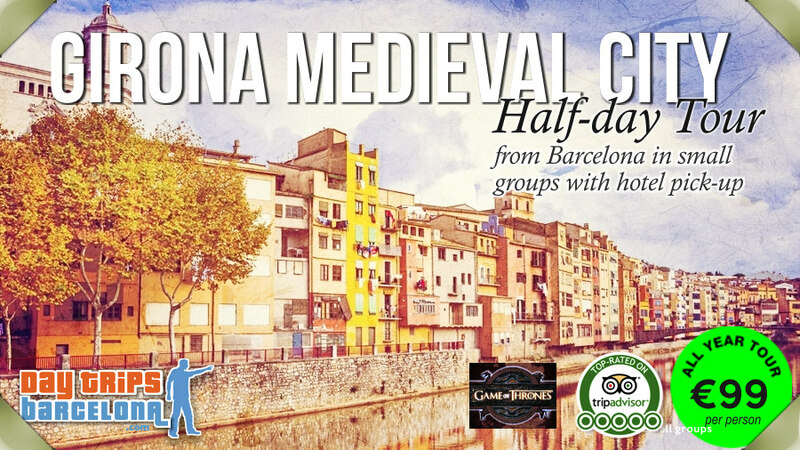 We also invite you to visit one of our partners and site sponsors, a recommended small group tour specialist called DaytripsBarcelona.com.